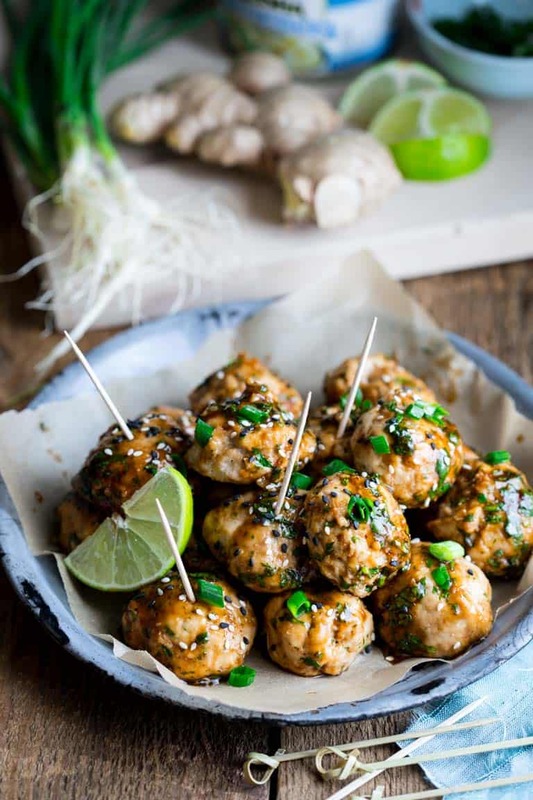 Hoisin Glazed Turkey Meatballs with sesame, ginger, water chestnuts and sweet and spicy hoisin sauce. 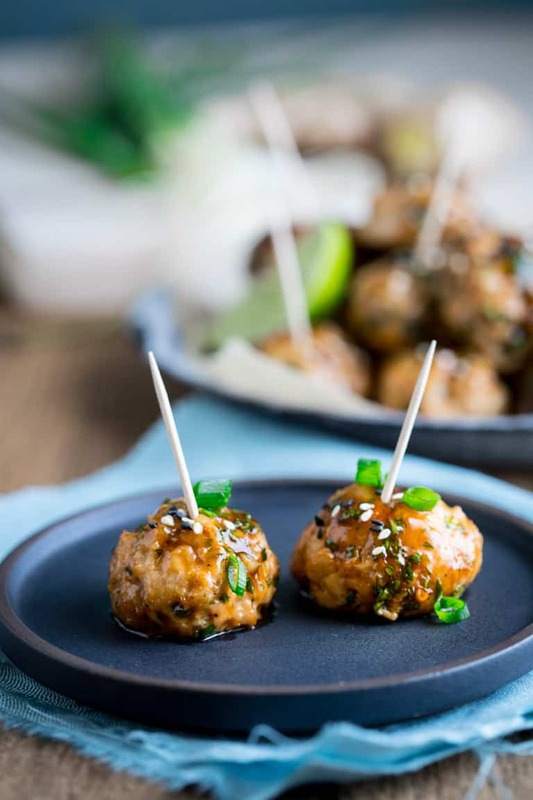 In this recipe, see how easy it is to transform lean ground turkey into a savory Asian meatball for a fun party appetizer or football snack food! I originally shared these Hoisin Glazed Turkey Meatballs on February 4th, 2011. I have updated the recipe, text and photographs today. That’s right! 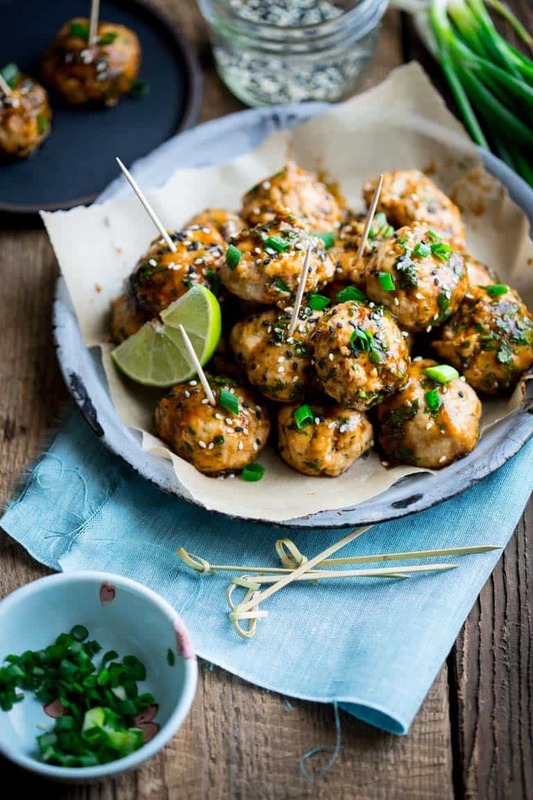 These Hoisin Glazed Asian Turkey Meatballs are new and improved! They’re like the 2 point 0 version of one of my most popular recipes ever, and they are even better! Since I started doing recipe refreshes two years ago, I have fallen back in love with so many of the recipes from the past. And I can only think of a couple that I have been really disappointed about. One was the Healthier Gingerbread Cake which when I made it, was dry and not at all what I remembered. So I proceeded to test and fix and ended up loving so much it landed on the Best of List. 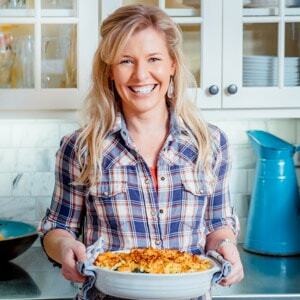 But other than that, I have been so happy to rediscover so many of the recipes I have shared over the last nine years here on Healthy Seasonal Recipes. 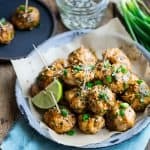 These Hoisin Glazed Turkey Meatballs were on the refresh list – but when I went to make them and photograph them again, they were not AT ALL the way I remembered them. And I was so bummed! So I decided to issue a good old fashioned apology to anyone who made these before, and didn’t like them. Friends, I was wrong and I am sorry. They sucked. So I went to town, bought more ingredients and proceeded to test the heck out of them. Over and over and over. And now they are like one of those completely newly designed cars! Now these little nuggets, balls, whatevs, they are Oh So Right!!! Oh So Good! They are pop ’em in your mouth and do your favorite football end zone dance good! Read on below to see how I fixed them up to be my new favorite football appetizer! Speaking of football. I do love it, but mostly because it gives us a great excuse to get together with friends and have a good time on what would otherwise be a sleepy Sunday evening. I love the spread of noshers and the clever commercials. Oh, yeah and the football too. I read somewhere that on Super Bowl Sunday, Americans consume enough Guacamole to fill a football field up to your waist! I’m not sure if that is true or not, but it gets me thinking that we need some new ideas for fun football snacks. This Football Sunday, break out of the mold and serve these sweet and savory turkey meatballs instead of the usual chips and guac. They are super easy, taking only 20 minutes of prep time. They are healthy and satisfying because they are made with lean ground turkey. And they are loaded with flavor because they have ginger and seasonings that will tickle your taste buds. Turkey can be rather boring on its own- so I added a ton of flavor in the form of tamari, sesame oil, ginger root (grated), Sambal Oelek (it’s a type of chili paste similar to Sriracha) and scallions mixed right into the ground turkey. To hold them together and give them a pleasant meaty texture I used Panko breadcrumbs. This is one of the changes I made that made all the difference. In the earlier versions of these meatballs, I had used cornstarch. And I don’t think they were getting hot enough to gelatin the starch in it. So I swapped in breadcrumbs. I tested with gluten-free breadcrumbs, and they didn’t have the same good texture as regular wheat panko breadcrumbs. Another change I made is I increased the amount of turkey to 20 ounces, because everywhere I looked packages of ground turkey were much more commonly 20 ounces than 16 ounces. I thought that was rude to have an extra 4 ounces of ground turkey left over, so I figured out how to make 20 ounces work in the meatballs. Now the meatballs are much easier to form too. Before they were too tender to shape into balls. Now they are more ball-like. Note that if the meat sticks to your hands, just moisten them a bit with water. I also added a sheet of aluminum foil to the baking pan so that you have less clean up to do! Once the turkey meatballs come out of the oven, let them rest a bit before tossing them in the Asian Hoisin Glaze. That will allow them to set up a bit so they aren’t likely to break apart when they go into the bowl with the hoisin, lime and cilantro. toss them in batches, so they don’t over-crowd each other in the bowl. I also increased the amount of glaze too. Because what are meatballs if they aren’t saucy. Now they are saucetastic! Folks, please remember to come back and review and rate these Asian Turkey Meatballs by leaving a comment below! Thank you for reading. For more football snacks make sure you’re following my Game Day Noshes pinterest board! 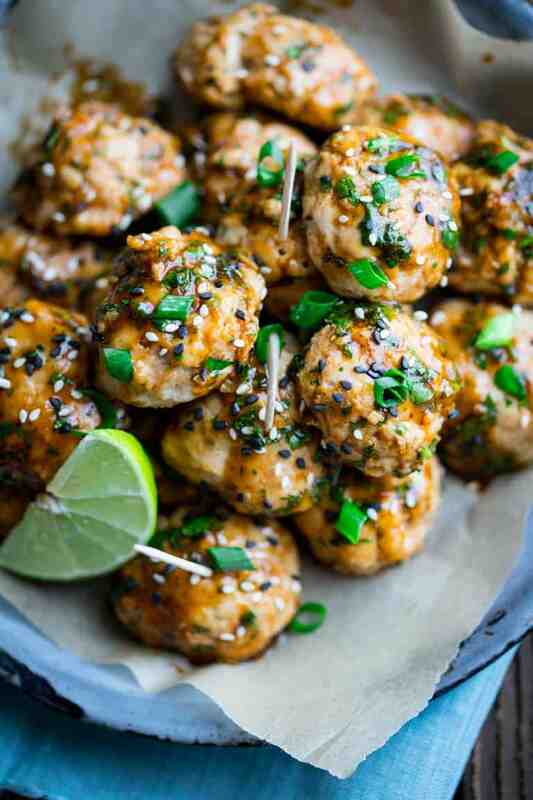 Hoisin Glazed Asian Turkey Meatballs with ginger, sesame and water chestnuts. The simple hoisin glaze is a mixture of hoisin sauce, lime and cilantro, and gives these lean appetizers a sweet and spicy kick! Serve them for a football snack or appetizer and watch them disappear! Whisk Tamari or soy sauce, sesame oil, ginger and sambal or crushed red pepper in a large bowl. Add 2 minced scallions, egg, turkey, panko and water chestnuts and stir to combine. Drop turkey mixture by rounded tablespoons onto the prepared baking sheet, gently re-shaping into ball shapes with moistened hands. Transfer to the oven. Bake until the meat is cooked through, 17 to 19 minutes. Let rest 10 minutes. Stir Hoisin sauce, cilantro and lime juice in a large bowl. Add half of the cooked meatballs and gently stir to coat. Transfer to a platter. Repeat with the remaining meatballs. Sprinkle with the remaining sliced scallions and sesame seeds and serve hot with toothpicks. Ingredient Note: Sambal Oelek is available in the Asian section of large supermarkets, Asian markets and health food stores. Those look amazing. I love any kind of meatballs! Yum! Wow!!! Just made this for dinner tonight. I “pinned” it on Pinterest and finally got around to making it. Full of flavor, it reminds me of a pot sticker, but HEALTHY! I served these over rice with zucchini. I will post about this on my blog tomorrow and credit you. Thank you for this keeper of a recipe! I am so glad that you liked these. 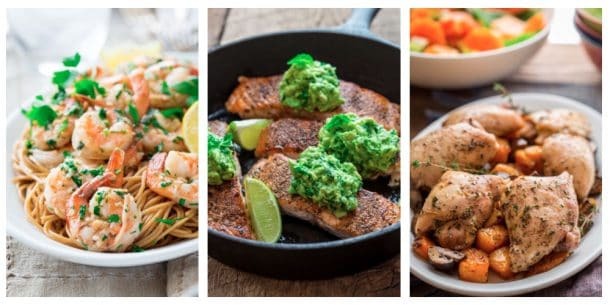 Your menu idea sounds delicious and summery! Thanks for the shout out and happy cooking. Really good recipe. I’ve made these 4 times and they are consistently delicious. The water chestnuts add a great fresh crunchiness to the meatballs. I pair this with spaghetti squash and toss the cooked “de-forked” squash in the mixing bowl with the hoisin glaze. A healthy and very tasty version of a classic. These are tasty. I had them for lunch and put them in a salad. I didn’t have water chestnuts but I did have some bamboo shoots that I put in for texture. They are full of flavour. I will be making them again. These are great! I added two cloves of garlic because ginger and garlic always taste good together. Yummy appy! And dairy-free too. I haven’t made them in a crock pot. They can be a little fragile depending on the turkey you use. The leaner the more sturdy. When I have made these ahead for parties, I have reheated them in the microwave. Hope that helps. Hi there! I made this for lunch. Instead of serving this as an appetizer I served it with some brown rice and a salad. It was delicious! My mom made these for a luncheon and she says they came out so badly that they weren’t even edible. I’m not sure if it was her fault or a bad recipe but she had to cater in her appetizer at the last minute! I am so sorry to hear that! I would love to trouble shoot with her to figure out what went wrong. Please have her send me an email, and I can help her figure out what may have happened. Just hit the contact tab and send me an email. These are the bomb! Made for my December Pin Party and everyone LOVED! Nice presentation and delicious. Making New Years Eve! [quote name=Anne]These are the bomb! Made for my December Pin Party and everyone LOVED! Nice presentation and delicious. Making New Years Eve! [/quote]I am so flattered and glad that everyone liked them. Thanks for the feedback! These are amazing! I added a hit of siracha in the glaze because we all like heat and served them with soba noodles flavored simply with sesame oil and rice wine vinegar. Delish!! We love heat too. That’s a great call. These look really good, I’ll have to try this recipe. Thanks Bill. I hope you like them. These sound amazing, and perfect for a Super Bowl Party! I’d love if you would share this, or anything you would like, at my Super Bowl Eats and Treats Linky Party. You can link up appetizers, desserts, entrees, crafts, party ideas, anything that says “Super Bowl” to you! We would love to have you! Looking forward for making them for the super bowl. Think I am going to use a substitute for corn starch since its not that good for you. So glad to hear it Sarah. As far as the cornstarch, there is only 1 tablespoon of it for 26 servings, and the other ingredients (fat protein and acidity) will help to buffer and slow the breakdown of the starches to sugars in the system. I agree it is not a terribly healthy ingredient, though my guess is that the 1/26th of a tablespoon per meatball is not likely to make a significant impact on many people’s overall health. That said, a lot of people are sensitive to corn, and I would love to know what a good alternative is. Please report back and let me know what you try, if you don’t mind. Thank you for coming by and the comment Sarah, I appreciate it. These look really good, I’ll have to try this recipe for sure. Oh, yeah!! I love meatballs…and hoisin. These are totally going on my Superbowl menu! Great appetizer for Thanksgiving Day! What delicious flavors in each of those meatballs. Such a wonderful blend of ingredients, and your photos are gorgeous! What an awesome load of flavors this sounds like. I am pretty sure that it must taste amazing too. Can’t wait to try it out. These are perfect for a party appetizer!! Hey Katie, I am coming for dinner if you are cooking these!! Oh yum, they look delicious and the flavours are right up my alley. That may be true with the guacamole and the football field tail – we eat a lot of that stuff hey! Pinning to my Asian Board so I can cook up a storm of these! Made these slightly larger and served them as an entree with spicy peanut noodles and stir fry veggies – huge hit for a weeknight dinner!